Need a new radiator? It’s easier than ever to purchase online with our pain free buyers guide. Once purchased, replace a radiator at home with these easy steps. Each end of the radiator will have a valve that must be turned off. While valves may look different, each must be turned clockwise. Turn the knob to the 0 mark. If your valve is unmarked, it may be a cap. Either pop or unscrew the cap of the valve, revealing the valve head. Turn this clockwise with a wrench or other tool. After turning off each valve, place a container under each. Be sure to let the radiator drip into the container before removing the radiator from the wall. Take your time to prepare well! Pre-emptively removing the radiator will result in water spills. The nut connecting the radiator and pipe must be loosened to allow emptying of the radiator. For the right side of the radiator, turn the nut upward. For the left side, turn downward. Be careful of breaking the connected pipe by mistake. Hold it firmly while loosening the nut. Do not remove the nut completely. This air valve allows air to enter the top of the radiator and the water to start running out into your container. Emptying out water is essential to replace a radiator. 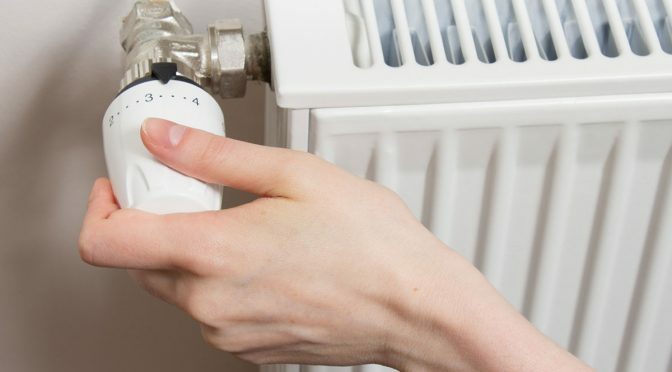 Radiators heat your house by running hot water from the boiler through their pipes. By letting out heat and steam, you’re able to control your house temperature at any time of the year. Container getting full? Turn the key again and press the pipe into the radiator. This will close the valve temporarily. Empty your catching container and replace. Repeat until the radiator is empty. Replace the container under the valve. When you lift the radiator away, some leftover water may still leak out. Tilt it toward the container as you lift, letting any remaining dirt spill out before placing on the ground. Line up the back of your new radiator with your wall brackets. Lift the radiator up, line them up and ensure the back slides into place. Slide the radiator to line up with your floor pipes, and turn the nut to start reconnecting the pipes. Tighten up with a tool, this time turning the right nut down and the left nut up. Turn both radiator valves back on and ensure your air valve is off. Your radiator is set and ready to go. Now how will you get the most out of your home heating setup? Incorporating smart technology could make your home’s energy use more efficient and enjoyable. Find more about smart heating and radiator compatibility here. Previous PostA Step By Step Guide To Refurbishing Cast Iron RadiatorsNext PostAre Designer Radiators Still Practical For Your Home?